Autonomous cars are self-driving vehicles that are capable of operating with minimal, or even zero, human input. These vehicles leverage artificial intelligence (AI) and preexisting automotive technologies like adaptive cruise control to automate the driving experience. Self-driving vehicles vary in complexity from basic systems that have to be constantly monitored by a human driver, to systems that are capable of operating in any conditions and with no human element at all. Companies like Waymo already have autonomous cars on the road, and automakers like Tesla, Ford, GM, and others have all developed their own autonomous vehicle technologies like Tesla Autopilot, Argo AI, and GM Cruise. Autonomous cars use a combination of artificial intelligence and vehicle systems based on existing Advanced Driver Assistance Systems (ADAS) to create something known as an Automated Driver System (ADS). The artificial intelligence at the heart of the autonomous car takes inputs from various sensors that are built into the vehicle, and it uses those inputs to create a picture of the outside world. With that picture, combined with a map of the area, and Global Positioning Satellite (GPS) data, the autonomous vehicle can safely plot a course through its environment. 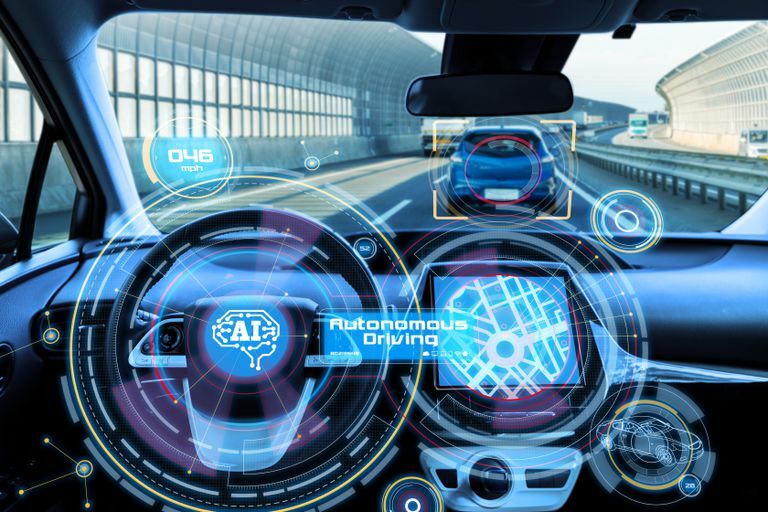 In order to move from one point to another, the AI taps into vehicle systems like drive-by-wire electronic throttle, brake, and steering controls. When the vehicle's sensors, which may include everything from radar to lasers, detect an object like a pedestrian or another vehicle, the AI is designed to take immediate corrective action to avoid an accident. In addition to full AI controls, autonomous cars are typically designed with the option for full driver control. In vehicles like this, the ADS acts as a very advanced sort of cruise control, where the driver can take or relinquish control whenever they like. Some autonomous cars are designed to operate without any human input at all, although the legality of driverless cars varies from one place to the next. For a car to drive itself, it has to leverage a number of technologies that have been in our vehicles for years, and in some cases even for decades. The car has to maintain electronic control over every system, from the engine and transmission to the brakes, and it needs some type of artificial intelligence to tie it all together. Most of the technologies that are leveraged in autonomous cars are known as Advanced Driver Assistance Systems, because they were designed to make the driving experience more comfortable and less dangerous. Artificial intelligence: Autonomous cars wouldn't be possible without artificial intelligence. These vehicles are controlled by AI programs that are developed and trained through machine learning to be able to read the data from a variety of sensors built into a vehicle and then determine the most appropriate action in any given situation. Drive-by-wire: These systems have been present in regular vehicles for years, and they basically replace mechanical connections with electrical connections and controls. This makes it a lot easier for a built-in AI to control each individual system, like steering, acceleration, and braking. Lane-keeping: These systems were originally designed to help human drivers avoid drifting out of their lane in traffic, but autonomous vehicles use many of the same types of sensors and techniques. Automatic braking: This was originally designed to prevent accidents by automatically applying the brakes in situations where the driver is too slow to act. Autonomous cars use similar technology on a much broader scale. Adaptive cruise control: This is another system that was originally designed to assist drivers, in this case by dynamically increasing and decreasing speed relative to the surrounding traffic. Autonomous cars have to do this same basic task in addition to everything else the driver would normally do. Degrees of Autonomy: Can Autonomous Cars Really Be Driverless? The development of autonomous cars was a slow march of progress, not a switch that someone decided to flip one day. It started in the 1950s with some of the first safety and convenience features that became commonplace over time, like anti-lock brakes and cruise control, and accelerated in the 2000s with ADAS like adaptive cruise control and automatic braking. Since autonomous cars have arrived through such a slow and incremental process, the Society of Automotive Engineers (SAE) developed a five-level scale of automation. This scale describes everything from the entirely manual vehicles of yesterday to the sort of fully-automated vehicles that are expected to appear on showroom floors and highways by 2020. These are traditional vehicles that require constant driver input to function. These vehicles don't even have features like anti-lock brakes or cruise control. These vehicles are still controlled entirely by the driver, but they include some common driver assistance systems. A vehicle at this level will typically include basic features like cruise control. At this stage, cars gain some level of automated control over functions like acceleration, braking, and steering. The driver is still in ultimate control over the vehicle, and a vehicle at this level cannot drive itself without a human driver. Vehicles like this typically have ADAS like automated braking, adaptive cruise control, and some type of lane-keeping system. Vehicles at this level include an ADS, so they are technically autonomous. These cars are capable of navigating from one place to another, identifying hazards, and reacting to them. The presence of a human driver is still required in case of an emergency, and the driver must remain alert and ready to take control. Every system in vehicles at this level has to be automated, and these cars also require an extensive artificial intelligence capacity to operate safely without input from a human driver. At this level, a vehicle is fully automated. It is able to safely navigate from one place to another under most conditions. Under some conditions, and in some circumstances, the car may still require human input. This type of autonomous car is technically capable of performing without the presence of a human operator, but the option for a human operator to take control may be included. Vehicles at this level of automation are truly autonomous and can operate in a driverless capacity in all driving conditions. Depending on the design, a human operator may have the option to take manual control, but these types of vehicles are designed not to require that type of intervention. What Are the Benefits of Autonomous Cars? The primary benefit of autonomous cars, and the driving force behind the development of autonomous cars, is safety. According the NHTSA, more than 90 percent of all serious crashes are caused by simple human error. The basic idea is that if the human element could be fully removed from the equation, many lives could be saved. In addition to the great loss of life caused by motor vehicle accidents each year, there is a similarly massive economic impact from these events. According to the NHTSA, accidents cost hundreds of billions of dollars each year in lowered workplace activity, damages, and lost economic activity. The more practical benefit of autonomous cars is that they could potentially reduce traffic congestion by operating more efficiently. That could result in shorter commute times for many drivers. Additionally, drivers would be able to use their commute time to read, catch up on the news, prepare for work, or engage in other productive tasks. Another benefit that autonomous cars could provide is increased mobility for the elderly and disabled people. Since these vehicles are capable of operating completely autonomously, they can be safely operated by people with impaired vision and reaction times, and even conditions like quadriplegia that would normally make it very difficult or impossible to safely drive a motor vehicle. With the ability to get to work, doctors appointments, and even shop for groceries, a great number of elderly and disabled people might be able to maintain a much higher level of autonomy than would be possible without access to a driverless car. The problem with most of these benefits is that automated cars only convey the full value of the benefit when there are a sufficient number of these vehicles on the road. For instance, autonomous cars can only remove the human element from accidents when there are no human drivers on the road. Similarly, autonomous cars would only be able to reduce traffic congestion if most of the vehicles on the road are driverless. Until autonomous cars become the new normal, the primary benefit of using one is mainly a factor of convenience, with some consideration to safety. What Are GM Cruise Driverless Cars? Are Self-Driving Cars Legal in Your State? How Do Hill Descent Control Systems Work? Can Your Car Stop Itself If You Aren't Able To? How Does a Lane Departure Warning System Work? Will Your Next Car Drive by Wire? How Would You React In A Panic Stop Situation? What Is Electronic Throttle Control?